Here’s a tip for all us girls who spend far too much time being critical of the way we look. OK, not the best tip, so here’s a more actionable one. If you find yourself looking closely in the mirror and examining your skin for all possible signs of blemishes, spots, uneven coloring, wrinkles or just anything that means “you aren’t perfect”… then take a step back. Literally. Because the amazing thing is, most of the ‘problems’ we have with our skin simply disappear when we don’t examine them from 2 inches away with a bright light shining on them! Nobody else sees us like that in the real world. This is our own personal warped view of ourselves, and no wonder we find things wrong with our skin that require endless products to fix. Yes, there are some things about our skins that we can and maybe would like to improve. But the first step is to make sure those things really exist after all, and are not just a ‘nothing’ placed under a microscope. So yes, spots and acne are a nuisance and can be treated and/or covered. Wrinkles can also be minimized, although I’m tending towards appreciating mine – they are fairly fine and simply reflect my years. Of more concern is areas of uneven color. I have some very dark patches of skin that actually do still stand out when I step back from the mirror. And they are something I would like to ‘fix’ without having to try and cover with makeup (I don’t like wearing much makeup). So I’m going to try out something new. I’m going to try a home skin whitening product. I’ve chosen Meladerm after reading various reviews. Mostly because it’s all about natural ingredients, and I really don’t want to use anything heavily chemical, particularly on my face. Some people don’t like skin whitening products, for various reasons. But for me I feel this is a carefully thought through, and perfectly jusitifiable decision. It’s an area of my body that is very much on show and important in the way other people see me. There are areas such as underarms where these whitening products can also be used, but personally I’d struggle to justify that. That’s not a major judgement, it’s just that personally hardly anybody ever sees my armpits! If you live in a bikini this is likely to be more important for you. Correcting things that really do bother you about your appearance is not wrong. It’s not something you should feel guilty about. If it causes you stress, and it is a genuine real problem to you (remember to ‘step back’…) then be bold and take a further step to fixing it. If the end results means you feel less stress, then it doesn’t really matter how genuine a problem ther people think it may or may not be. We all know that stress feeling. And we don’t really need a doctor to tell us that it isn’t good for us. When you’re in a state of stress you can just feel the harm it is doing to you. It can play a useful role, but if it’s something you feel on a regular basis, then it’s also something that you need to learn how to control. And how to allow your body to recover in the least possible time. 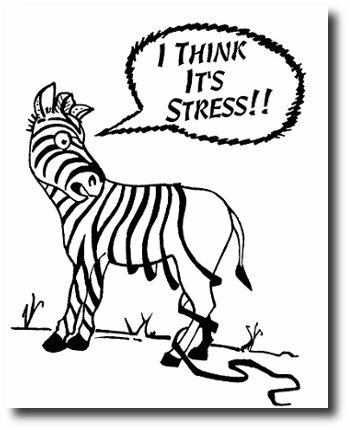 Don’t let stress be something you just live with.